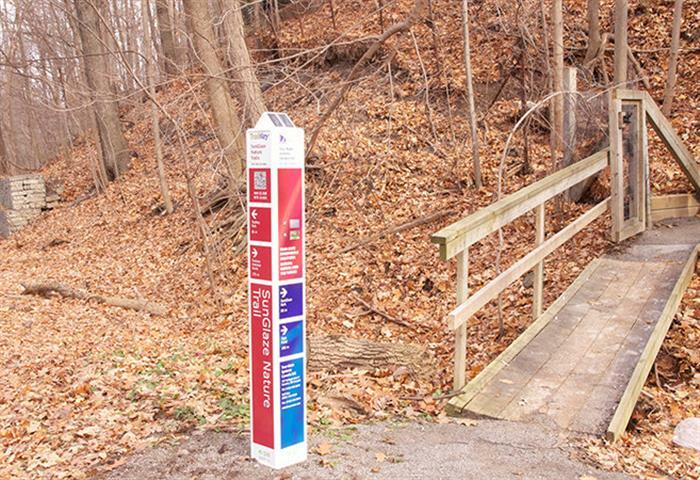 A photo of trail identification signage that incorporates large-print, tactile and audible information. Source: Tour-Mate Systems Limited. Audible signs are signs that use speech technology to supplement the information typically found on print signs. Don’t use audible signs exclusively, as they don’t provide an accessible solution for individuals with hearing loss. More and more, audible signs are becoming part of the built environment for the benefit of most users, not just those with blindness. They are commonly used in elevators to direct passengers to the correct floor. They are being used increasingly by public transit systems to automate the announcement of upcoming stops and the destination of arriving transit. Audible signs should be simple and intuitive to use. They should be audible only when required (i.e., to the user only, not to all passing people) and silent when necessary. Audible signs can be manually activated by a button or other control, or automatically activated using technologies such as radio-frequency identification (RFID) or Bluetooth. New technologies are evolving rapidly. Automatic activation is preferred, as buttons/controls can be difficult to locate by people impacted by blindness. Applications for RFIDs are expanding. They are being used on sidewalk pavements to orient people to their surroundings.